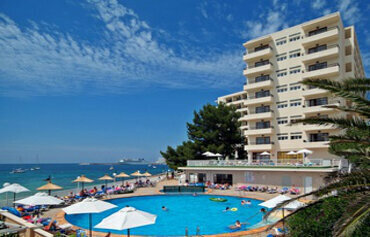 For relaxation in the Ibiza sunshine, you cannot miss the 3 star all inclusive Intertur Hotel Hawaii Ibiza. Making the most of its beachfront location, adjacent to the golden sands of Es Puet beach in San Antonio, it is easy to see why this hotel is a favourite. The public areas are modern, stylish and spacious. So are the well equipped guest rooms. Daytimes are all about bagging a sun lounger on the sun terraces by the pool and enjoying amazing views across San Antonio Bay. The children will be well looked after too with their own pool, kids club and playground. No need to wander too far for a drink or snack with plenty of places to refuel onsite. If you want to feel the sand between your toes, having the beach on your doorstep is a real bonus. In the evening, a vast array of dishes await in the buffet restaurant. Then why not kick back and relax with a cocktail in the lounge bar or be entertained with live music and professional shows onsite. The bright lights of San Antonio centre are just a stroll away along the pedestrian walk. With its purse-friendly all inclusive and a stunning setting, discover for yourself why the 3 star Intertur Hotel Hawaii Ibiza is much loved by families and couples alike. The 3 star Intertur Hotel Hawaii Ibiza boasts abundant facilities for guests to enjoy. Highlights include swimming pools for adults and children, sea view sun terrace with loungers and parasols, Mini Club (4 to 12 years), playground, entertainment for all ages, internet access (charge), terrace, bar/cafe, restaurant, 24 hour reception and currency exchange. Sports wise, there is aqua aerobics, water polo, French bowls, darts, billiards, table tennis and archery. 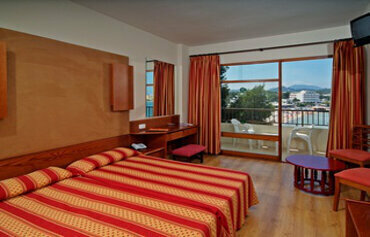 The Intertur Hotel Hawaii Ibiza offers 210 modern and stylish guest rooms. Room choices include standard, sea view, premium and single options. Standard room facilities include: Private terrace, twin beds, air conditioning, bathroom, safe (charge), heating, hairdryer, flat screen satellite TV, telephone and cot available. Dining at the all inclusive Intertur Hotel Hawaii Ibiza is pleasure, with a good selection of onsite eateries to choose from. The hotel restaurant serves buffet style meals for breakfast, lunch and dinner with show cooking. The snack bar, lounge bar and pool bar are the perfect spots for snacks and refreshments throughout the day. The daytime and evening entertainment programme has something for all ages and tastes. 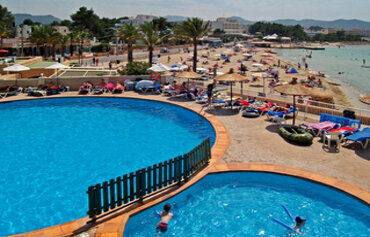 The Intertur Hotel Hawaii Ibiza is located adjacent to the Es Puet beach in San Antonio. 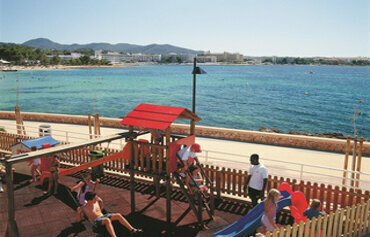 San Antonio centre is approx 1.5km from the hotel and Ibiza airport 12kms away..